Is there a better alternative to iP2F? Is iP2F really the best app in Author Tools category? Will iP2F work good on macOS 10.13.4? iP2F... Easily share your iPhotos with your Flickr friends. 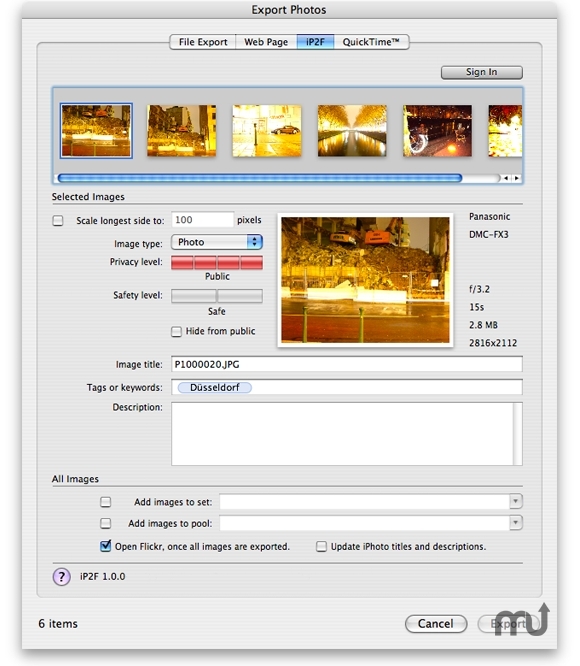 iP2F is a plugin that makes it extremely easy to upload your pictures from iPhoto 2 Flickr. Before you upload to Flickr you can resize, rename, describe and tag your images with smart, Mail-style tokenfields - all directly out of iPhoto. iP2F also lets you create photosets and add images to existing sets and pools. And of course your EXIF image meta data (camera model, exposure, etc.) is preserved. All that and more in one clean, easy to use and modern-looking plugin, which lives right in iPhoto's File > Export... menu. Mac OS X 10.4.11 or later, Photo 5, 6 or 7 (aka iPhoto '08). iP2F needs a rating. Be the first to rate this app and get the discussion started! To get started after the installation, select some images and go to iPhoto's File > Export... menu. Then select the iP2F tab.